A New Twist on Viking Knit! One aspect of creativity is combining ideas. Finding new ways to use and combine materials is another one. 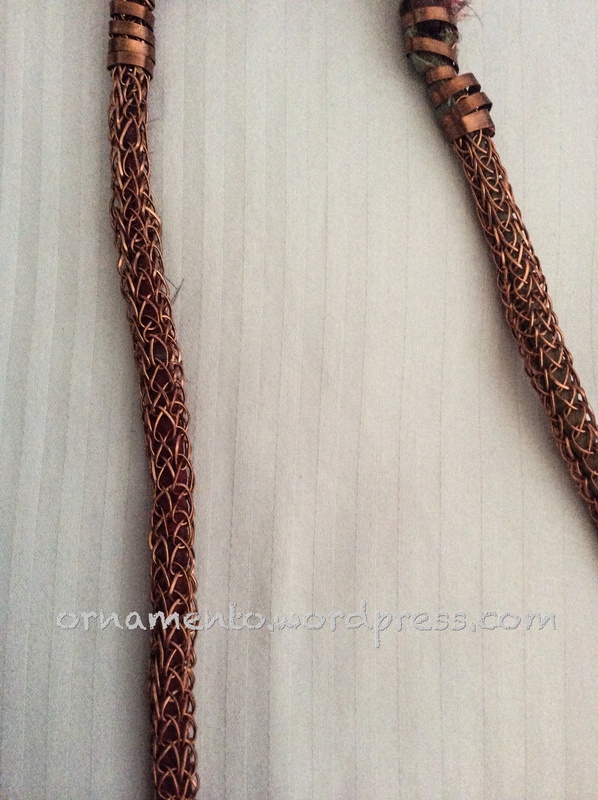 I have been interested in Viking Knit for some time and between experimenting with alternative ways to do it and alternative tools to make it, I came up with some new ideas to give single weave Viking Knit a new look. I found this beautiful fabric on a discarded window treatment. This is what it looked like after I washed and dried it. 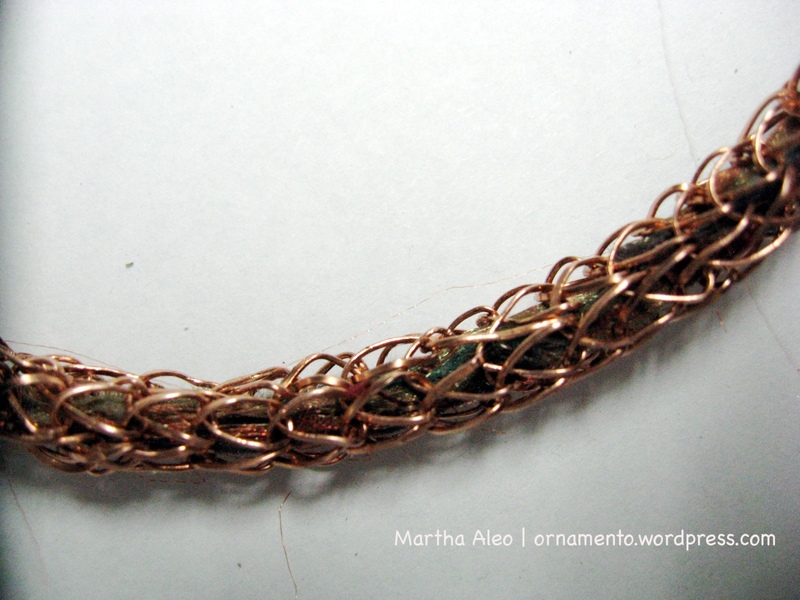 The blued and coppery hues reminded me of the copper wire I use in Viking Knit. And I love the contrasting look you get with using ribbon with stones or metal. 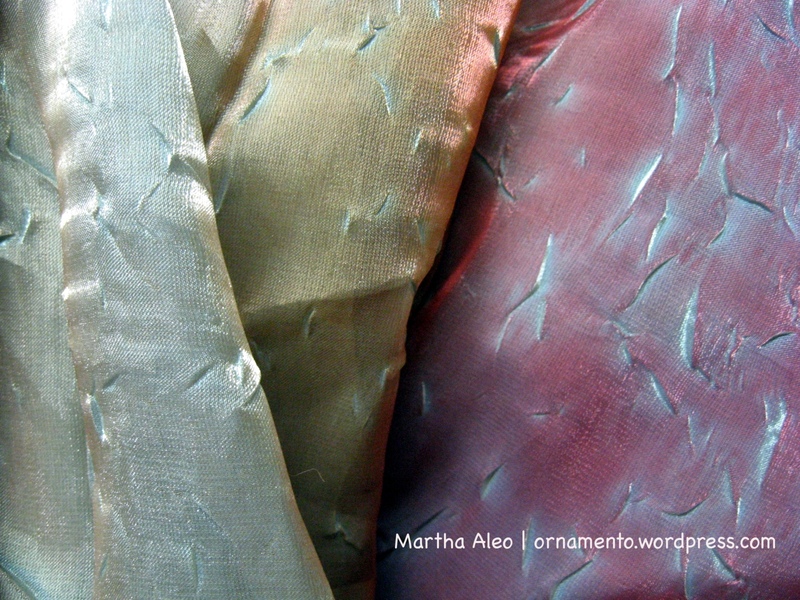 Why not thread some of this luminous looking fabric through the Viking Knit? 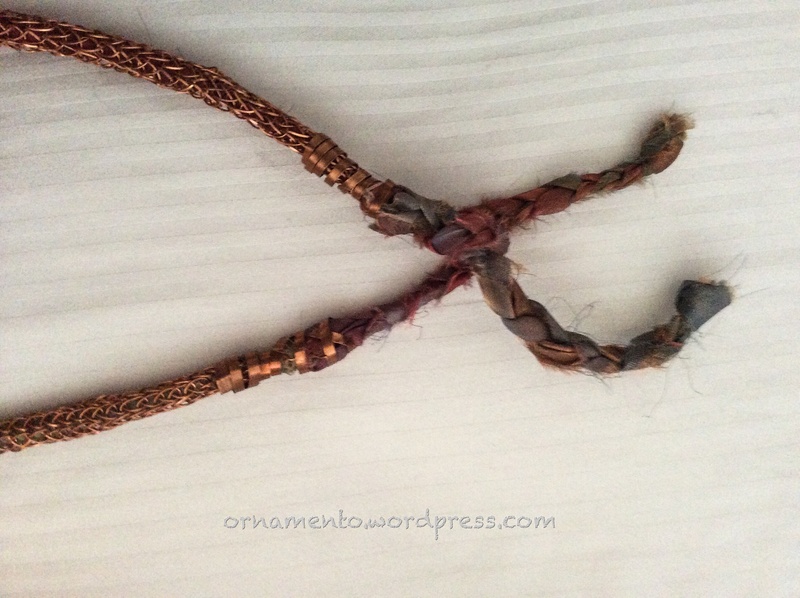 Ok, the first thing I learned is that you do not, I repeat do not pull the chain through the draw plate before you thread the fabric through- do it before. Just make sure the fabric or ribbon is long enough to fill the length of the knit after its final pull through the draw plate. 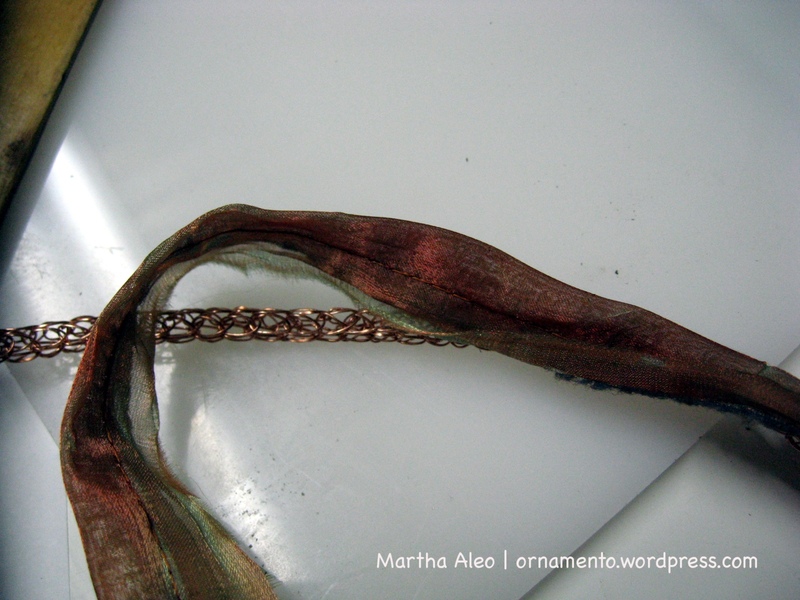 The fabric does not make the chain any thicker or harder to pull. I’ve used 24 gauge copper here. See the fabric inside? I don’t recommend using fabric inside of double or triple weave because you really won’t see it. Besides, double or triple weave is beautiful on its own. So, what can you do with your ribbon filled Viking Knit? Here are some ideas. Run with them. This is a necklace that I’ve finished with bands of flat copper wire run through a rolling mill. 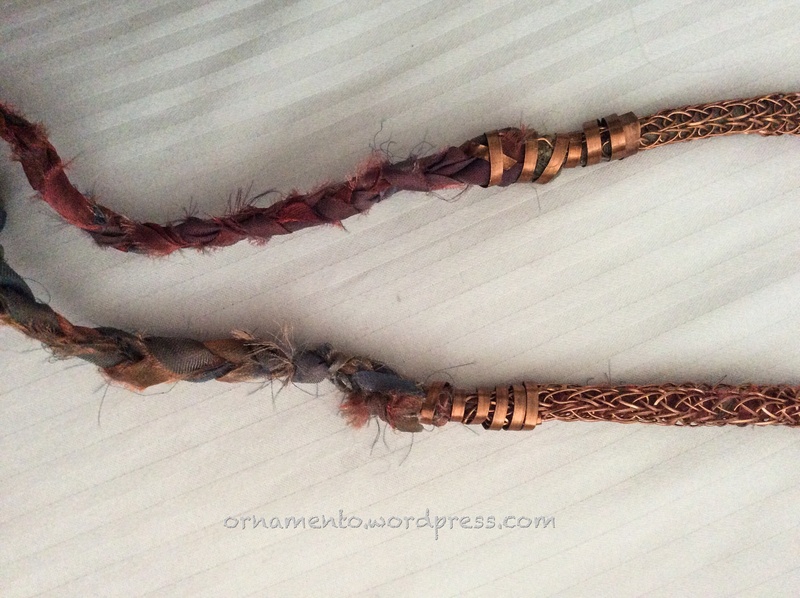 I braided the ends of the wire. The ends are purposefully left raw and unfinished for a funky look which might not be for you. 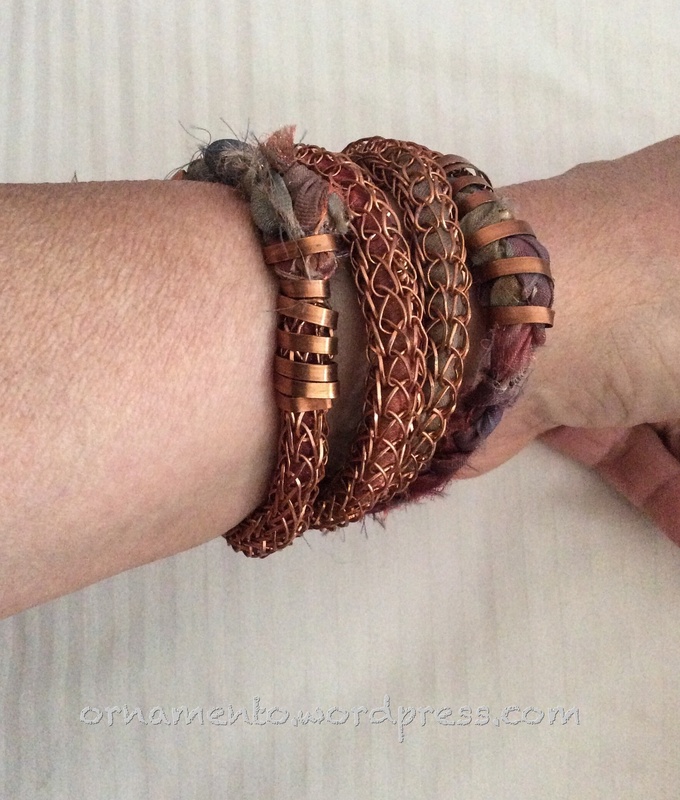 These pictures are of a Viking Knit that’s around 20 inches long (excluding fabric ties) that I’ve made into a multi-strand bracelet for a funky bohemian look. You can try different fabrics, add beads, finish the ends however you want- the sky’s the limit. 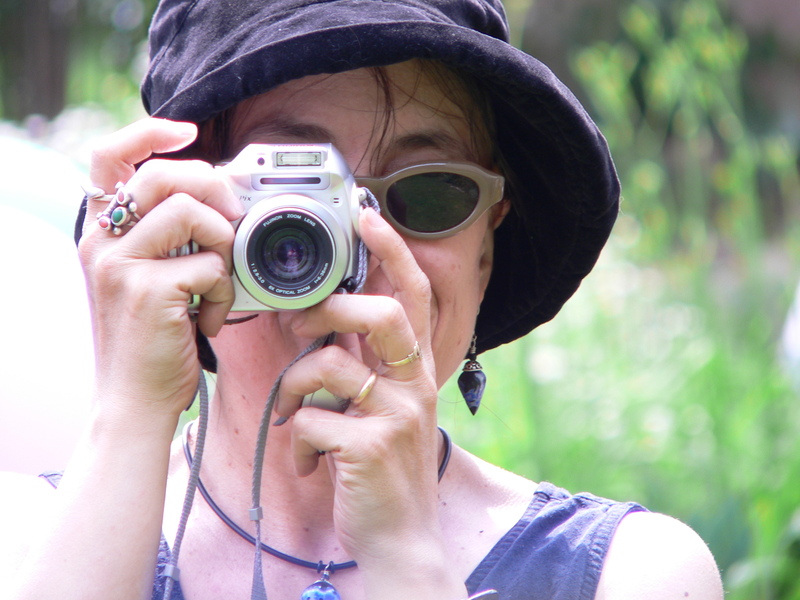 Make something that looks different from what everyone else is doing! Play and have fun. 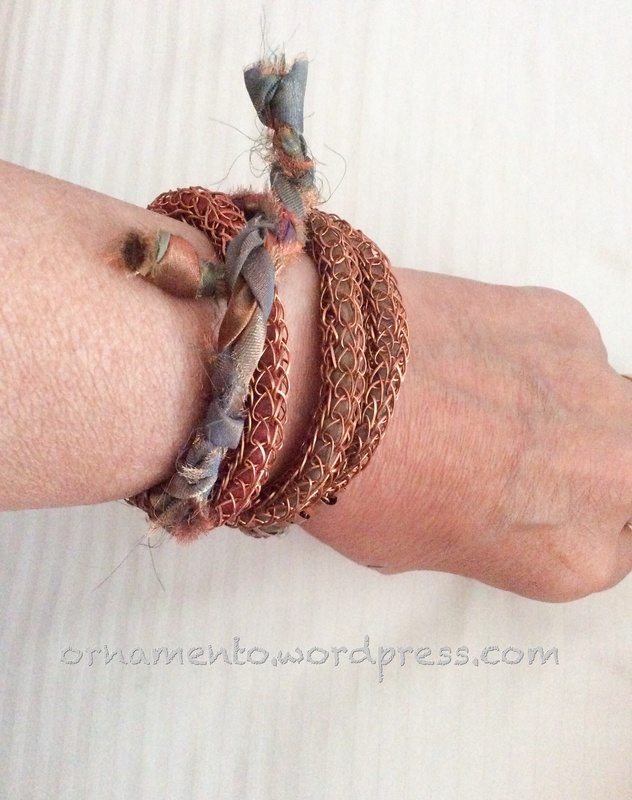 3 replies to A New Twist on Viking Knit! That is really pretty. (-: Thank you for sharing.